I'm finally in the spirit of the holidays. We've already bypassed Thanksgiving and now we're full steam heading toward Christmas. It seems like leading up to Thanksgiving takes a couple months, and then we blink and Christmas is over and the new year has begun. One of the things that say Christmas to me is Hallmark! I was so excited to be sent a Hello Kitty itty bitty from Hallmark as a little "thinking of you" gift! Isn't that sweet? I just love Hallmark! I love them so much, I just found out I'm part of their Platinum rewards. Not too shabby, eh? My kids dig the itty bitty line. Hello Kitty probably wouldn't fit well in this testosterone filled house. 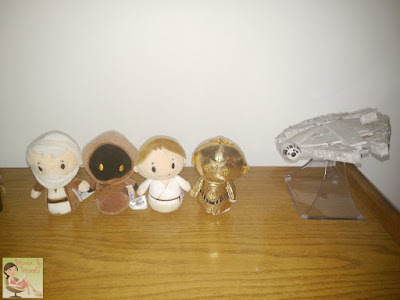 My son has 4 of the Star Wars itty bittys. I figured if they aren't going to appreciate this adorable little itty bitty, I know one of my readers will! Hello Kitty & Friends itty bittys are dressed for the season and Hallmark will make a donation to Toys for Tots for each one purchased between now and Christmas Eve! Be sure to keep that in mind when you're out shopping this holiday season! Also, if you buy one you can get one 50% off until 12/24/16! Check with your Hallmark store or Hallmark.com for details. I like the itty bittys Keroppi. He is so cute. 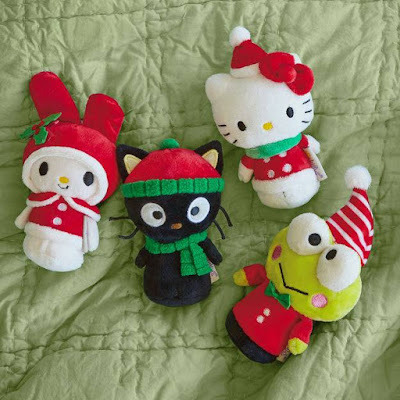 My favorite one is the itty bittys® Keroppi® Holiday Stuffed Animal Limited Edition. I love the Chococat itty bitty. It would be cool if they'd add Hello Kitty's sister Mimmi -- my daughter loves the show. I like this cute little critter for our Christmas Tree; itty bittys® Chococat® Holiday Stuffed Animal Limited Edition- It reminds me of our black cat Ozzy! I like the itty bittys® Chococat® Stuffed Animal. Thanks. I also like the Jumbo itty bittys Hello Kitty stuffed animal. I like the itty bittys® Chococat® Holiday Stuffed Animal Limited Edition! They are so cute! Love this it is so cute and my grand daughter would love it too! I love the itty bittys® Chococat® Holiday Stuffed Animal Limited Edition, it is adorable. Also the Hello Kitty®/My Melody® itty bittys® Clippys. itty bittys® Chococat® Holiday Stuffed Animal Limited Edition because we have a black cat. 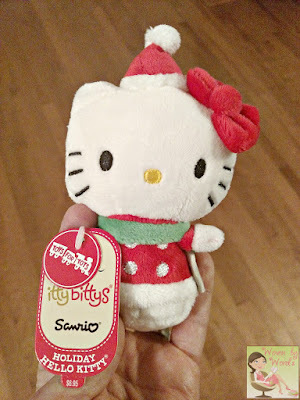 I love the itty bittys® My Melody® Holiday Stuffed Animal Limited Edition. It's too cute! I also like the itty bittys® Keroppi® Holiday Stuffed Animal Limited Edition. The itty bittys® Chococat® Holiday Stuffed Animal Limited Edition is adorable! I like the Hello Kitty itty bitty lovey. My favs are the holiday hello kitty you featured and the regular hello kitty. I love hello kitty. I've got a bunch of stuff still from when I was a kid. And then I lived in Japan for a couple years and bought some cool hello kitty stuff there I'd never seen in the states. thanks for the chance to win.. oh, and btw, my sister and her BF would love those Star Wars ones, ill have to tell her! 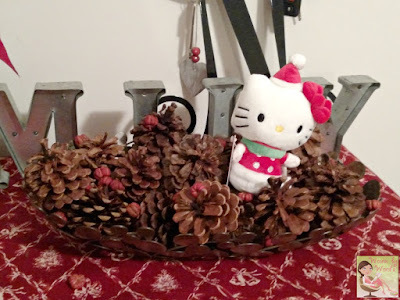 I love the itty bittys® Hello Kitty® Ornament. How cute and sweet is Chococat Holiday stuffed animal?! That would def be our pick! I like Itty bitty Chococat. i love chococate! so cute! I like the itty bitty chococat - he looks sweet. I also like the itty bittys® Hello Kitty® Lovey. It is so cute.